This short piece is intended to be a reflection on how visual art can inspire, or be articulated by, poetry. There’s a deadline, I’m writing quickly, and I’m thinking through my own processes of writing, as well as how I would express that as a ‘Lecturer in Creative Writing’. This is a piece of writing, therefore, that is intuitive and based on my own experience. It’s about praxis; how I’m implicated. The relationship between the visual and the poetic that I’m describing necessarily includes me. You have your own, and I’m interested in knowing how the three of you are getting on. In early 2009 I participated in a commission for the Whitewall space in Milton Keynes, England. Along with poets Mark Goodwin and John Gallas, I wrote accompanying poems for a series of photographs by Zoe Childerley. The photos had been taken in a range of locations in Asia and for Zoe represented elements of myth and folklore from those countries. Our task was to respond to them. The photos were hung on the big white wall, and the poems stencilled onto the white background alongside them. Then we had a beer and went home. We don’t really know what happened next, or what the response was, so I’m going to discuss my take on the process. I don’t like to see these issues in black or white, so let’s consider a spectrum of colour. It’s an apt enough metaphor for the subject, so let’s see where it gets me. It seems to me that the poetic response to visual art can go from the abstract to the programmatic, and fix any point in between. At one extreme, the image, colours and medium are completely disembedded from the artist and the context of the artwork. At this point, the poet looks at the art and responds with no concern for the intentions of the artist, or for the title, or for the location of the work (literally in terms of physical position or metaphorically in terms of the relationship with the artists other work, or pieces that deal with similar subjects). At the other end of the spectrum, the poet tries to tell the story of the piece. At this end, the emotional response of the poet is subdued (although ever-present) to the exigencies of explaining a narrative. Of course, most poetic responses will occupy a ground somewhere in between: coloured by some emotional response, but faithful to the named subject matter, or briefly referencing the narrative whilst writing a piece that only shares some tones with the visual. I’d like to discuss two examples. 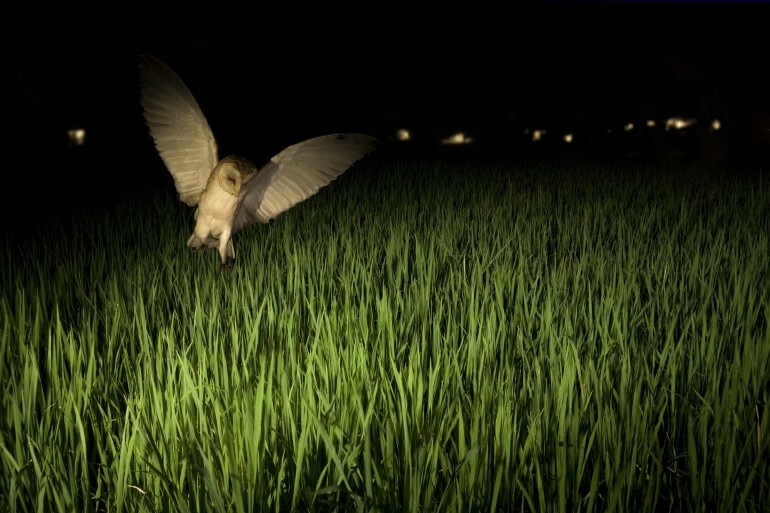 Zoe Childerley’s photo shows an owl, poised with wide wings over a field of green. Lights shine in the distance. The lighting is dramatic, as is the poise of the owl. The movement suggests a before and after: this photo is a moment, not a state. Zoe explained that in the belief of the Tarai people, Laxmi flies over the earth in the form of an owl, blessing the houses of those who have lived well that year. I’m in business. That owl is one image in a narrative that is now shared by the visual and the poetic. So I’m working in colours that have already been supplied, and I’m writing a companion piece. Yes, I’m present in my breathless response to the image, but the story is to the fore. I’m using place names, details of tangible things, describing a process with several agents. There are women bustling, Tihar lights, rice in boxes. I’m trying to unlock the story. An imagined ‘we’ enters the narrative in the last stanza, but nobody knows who that ‘we’ is. Mark Goodwin, on the other hand, captures the moment. There’s no cultural context: the place is everywhere; the time is now. Owl, vole, lights; that’s all you get: it’s all the poem needs. My Tarai, with its specific kind of lights, is instead ‘a world’s background’. The barn owl is not Laxmi but simply ‘that owl’. Mark’s poem starts with a sudden end, and ends with a dreaming background. Mine also starts suddenly, but the place is named, and the poem ends with dawn. Mark’s poem kicks suddenly through a narrative that takes no longer than the photo; mines seems to move in different directions, and implicate a larger cast. Neither of the examples describe responses at the far end of the spectrum I’ve described above: they are both positioned somewhere in between. Both poems see the owl as an owl, and place it in a narrative, albeit narratives of differing length and focus. In crude terms, Mark’s poem says “this is the moment of my seeing the moment of the photo” and mine says “this is how the moment fits into its context”. Of course aspects of those subjective positions cohabit each poem, but you see what I mean. At the other end of the spectrum, a writer might discard the owl: “there’s a blurry block of creamy-white colour above darker bands. It’s all surface. Who needs the owl?” Well, I think I do. This is not simply a question of unpacking the varying degrees of narrative present in the project of any given visual piece. It is possible to write a narrative response to Rothko’s massive blocks of colour, as it is possible to respond in a personal or abstract way to Tracey Emin’s ‘Tent’ or to Dutch genre painting. As a teacher, I work a lot with visual art and tangible objects, but I try to make students aware of the possibilities in any piece, rather than closing down the response by suggesting that each one is better suited to writing from any specific position on my abstract/narrative spectrum. The participants in a workshop are encouraged to bring their own light to the piece, and to see what colours are refracted out.I don’t want to go deep into the pedagogy of teaching creative writing here, because I’m still watching the owl, and I want other people to see the owl as well. Suffice it to say that the specifics of language, culture, age and motivation are a part of the context here. The individual who has never seen an owl will respond differently from the birdwatcher who fights to save the habitat of living owls. Some of the participants may be owls themselves. These require careful handling. So what are the students trying to do? Describe that owl? Write about any old owl? Imagine their own owl? Respond to the inner owl? Any of these is fine, it seems to me. My job as a workshop leader is to help them to understand something about the owl that they’re seeing, and to express it in a way that makes sense to them and what they are writing. At one end of the spectrum, the image is catalyst to a story that they already have, and will help with the start of telling it. At the other end, they will feel the ‘sudden tight grip’. So. I need the owl, but I understand those who don’t. That’s not to say there’s no spontaneity or personal reaction in my poetic response to the visual. It’s just that I’m less likely to disembed it from the artist’s project, the cultural context and the narrative that suggests itself. Perhaps there’s a selfish need to be implicated: to control that narrative, or to introduce myself into it, even if only as the teller. Perhaps there’s a fear of not being implicated, of being left outside. Whatever the reason, this is my process of response to the visual. It’s narrative-based, and involves me more than that might suggest. I’ll show you the owl, but in doing so perhaps I’m also showing you me. 1A note for those who hate owls. If you’re deeply uninterested by the owl, or even sickened by its owlishness, write about that. The writing will be just as good as that perpetrated by the owl lovers.